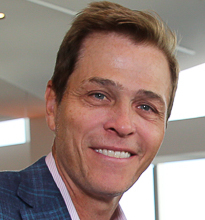 Patrick Whitesell (born February 4, 1965) is an American talent agent and co-CEO of WME, an entertainment and media agency. He joined the Endeavor Talent Agency as a partner in February 2001, where he was a member of the company’s Executive Committee. Whitesell was born to a Jewish family on February 4, 1965 in Iowa Falls, Iowa. He is the son of Patricia and John Patrick "Jack" Whitesell. His brothers are the late film and television actor Sean Whitesell, Thomas Whitesell, writer Christopher Whitesell, college basketball coach James Whitesell, and director John Whitesell. Whitesell graduated from Iowa Falls High School in 1983. He graduated from Luther College in Iowa in 1987. Whitesell worked at InterTalent from 1990 to 1992. He was an agent at United Talent Agency (UTA), from 1992 to 1995. Whitesell served as head of the talent department of Creative Artists Agency (CAA), from 1995 to 2001. Whitesell and WME co-CEO Ari Emanuel have been characterized as “rewriting the Hollywood script,” and they have been named to Fortune’s Businessperson of the Year list. Whitesell is an appointed member of the Governor's California Film Commission and an associate member of the Academy of Motion Picture Arts & Sciences. Whitesell resides in Beverly Hills, California with his wife, news anchor Lauren Sánchez, and three children. ^ "Patrick Whitesell Bio". IMDb. July 13, 2015. Retrieved 14 July 2015. ^ Littleton, Cynthia (April 27, 2009). "WMA, Endeavor approve merger". Variety. ^ a b c Brodesser, Claude (February 26, 2001). "Whitesell exits CAA". Variety. Retrieved 2 October 2014. ^ Brook, Vincent. From Shtetl to Stardom: Jews and Hollywood: Chapter 1: Still an Empire of Their Own: How Jews Remain Atop a Reinvented Hollywood. Purdue University Press. p. 11. ^ Solomon, Deborah (December 10, 2010). "Questions for Patrick Whitesell". The New York Times. Retrieved 2 October 2014. ^ Eller, Claudia (October 14, 1992). "Ex-ITA exex cut deal to move to UTA". Variety. Retrieved 2 October 2014. ^ Garrahan, Matthew (December 6, 2011). "Rewriting the Hollywood script". Financial Times. Retrieved 30 April 2012. ^ P.N. (November 19, 2010). "Businessperson of the Year". Fortune. Retrieved 30 April 2012. ^ "Patrick Whitesell Bio" (PDF). Archived from the original (PDF) on 3 March 2016. Retrieved 2 October 2014. ^ "Lauren Sánchez Whitesell and sons attend Second Annual Kidstock Music and Art Festival – Moms & Babies – Celebrity Babies and Kids - Moms & Babies - People.com". Celebritybabies.people.com. 2008-06-02. Retrieved 2015-06-02.